We thought all the technology salvaged from the Terminators had been destroyed. We were wrong. We all get the occasional urge to create an unstoppable killing machine covered with living skin, but usually those neural net processors are just too pricey to afford. But if you don't mind fitting used parts in your hyperalloy combat chassis, you can bag a cyber-brain of your own for just a few hundred bucks. Online auctioneer Juliens Live is selling a pair of brain chips that were used as props in Terminator 2 in 1991. The larger of the two chips is made of plastic and measures 3 Â¼ inches square, while the smaller chip is made of metal, and measures about 1 inch by Â½ an inch. The starting bid is a hundred dollars, and the lot is expected to fetch around $200 - $400 dollars when the bidding opens at 9am PST on December 3rd. 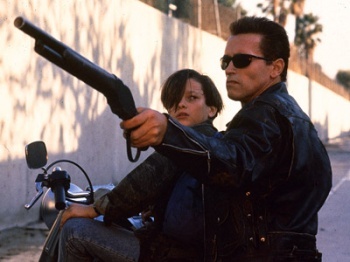 Other T2 related goodies include the boots that Robert Patrick wears when the T-1000 is frozen in the steelworks, and an official Terminator 2 leather jacket given to a member of the crew. A couple of hundred dollars isn't a bad price for a genuine movie prop, even if it is a little on the small side. If you do buy it though, try not to let anyone reverse engineer anything from it. I'd prefer not to wind up dead or enslaved by murderous robots.